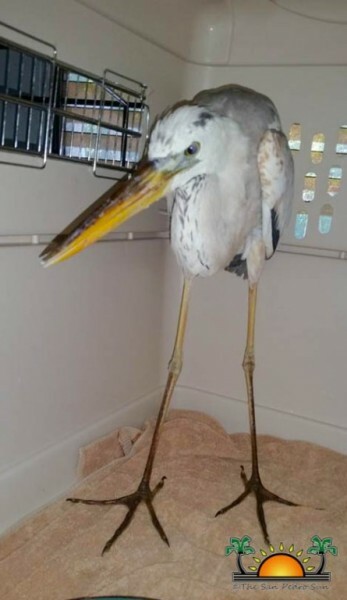 On a mission to save a bird in distress, Chris Summers, crocodile conservationist from the American Crocodile Education Sanctuary, and Tamara Sniffin of The San Pedro Sun, rescued a heron that appeared to be injured on Monday, April 24th. 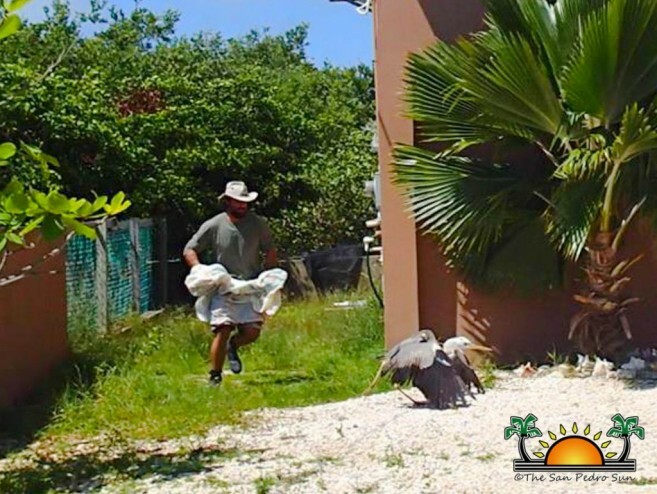 Their rescue effort came after concerned resident, Lindsay Reeder, contacted the Belize Bird Rescue (BBR) on the previous day, reporting that she spotted the bird struggling to fly. The heron was rescued the following day in the San Pablo area around 11:30AM. Once the bird was successfully captured, it was transported to the Saga Humane Society, to be placed in a crate. 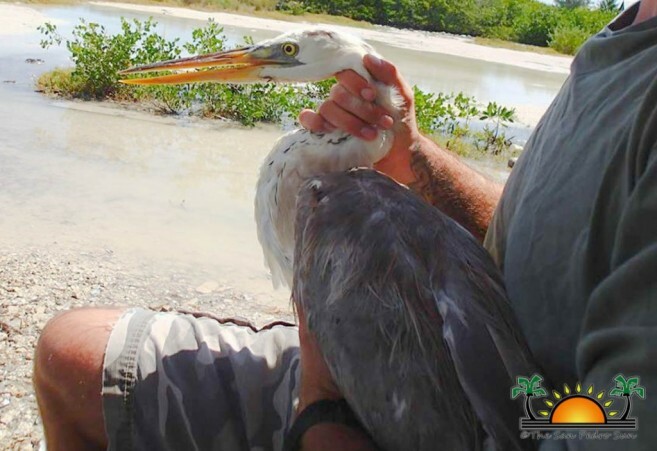 It was then flown over to Belize City, complements of Tropic Air, where Gordon Kirkwood, a BBR friend, picked up the heron, and transported it to BBR in Roaring Creek, Cayo for further veterinary treatment. Nikki Buxton, Managing Director at BBR, was able to examine the bird. “The heron was very down, but it did not have any injuries or serious parasites, which is the usual reason for them being down. 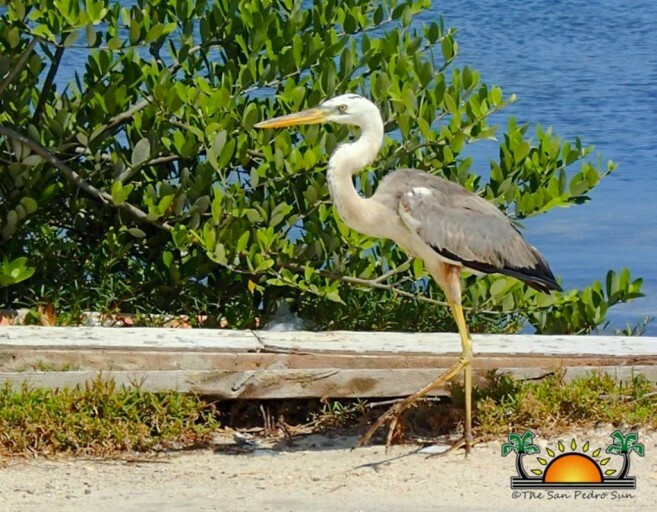 I think he's a juvenile and he is a strange 'morph' (coloration) of the Great Blue heron, so it's also possible he was rejected by his flock,” said Buxton. She indicated that the heron is doing much better, and is a lot stronger. He has gained 100 grams so far by eating small river fish, small sea-fish snappers, and mice, bringing his total weight to 1.6 kilograms. Although this case is not one of animal cruelty, Buxton reiterates the importance of not only preserving birds, but all wildlife. “Everything has a place, and interfering with wildlife is illegal. We are slowly displacing and upsetting them all. If we don't help them, we may lose them forever. We are putting severe stress on every species with our abuse and destruction of their environment and habitat. We cage, we poison them, and over-hunt them. We shoot them for fun and sport. The least we can do is be considerate, and use our resources to help those in distress and get them back out into the wild,” said Buxton. The general public is also reminded that birds are currently in their breeding season, and thus should check for nests before chopping down a tree or bush. BBR states that individuals can also assist by placing a bowl of fresh water outside, especially during this time of year when birds can suffer from heat exhaustion. BBR states that many people have been interested in rescuing birds, but do not know the proper procedures. Buxton said that while callers are always willing to help, and are eager to know what to do, they are surprised to learn that even good intentions can result in more harm than good. “In a perfect world, you can throw a sheet or large towel over them, bundle them into a crate and get them transported to BBR through a water taxi or Tropic Air for free. However, a water taxi ride takes long if the bird is seriously injured and Tropic can only fly them if there's space inside the cab, as it needs its own seat,” said Buxton. BBR also does do not encourage individuals to rescue birds like herons or pelicans, as these big water birds have sharp beaks that can injure the rescuer.